It has been a while since I did a comic haul article, but that doesn't mean I haven't bought some things. Check out this comic haul with a month's worth of content! I've been drastically cutting back on what I buy, not just with comics but with everything, because as you might have seen here I'm going to be unemployed fairly soon. I honestly don't know what I'm going to do, and that's pretty scary. These books have been bought over the course of the month. The old me who had no doubt he'd have a job for the foreseeable future might have bought all these in a week. Sadly that's not the case currently. But let's not talk about that. 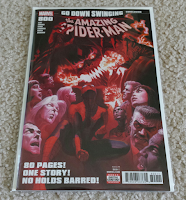 This is a comic haul article, so let's get down to it. 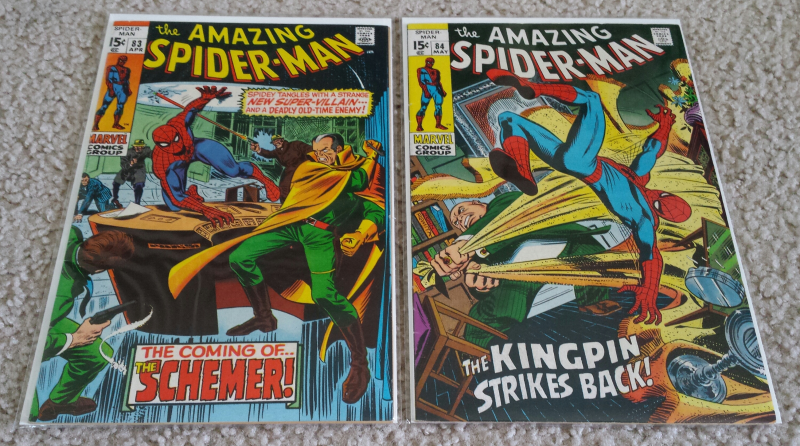 First, let's start off with these two old issues of Amazing Spider-Man. These are issues #83 and #84. #83 is the first appearance of the character named the Schemer, who is the Kingpin's son. It also features the first appearance of Vanessa, who is Kingpin's wife. You might have seen the character appear in the Netflix Daredevil series played by Ayelet Zurer. #85, however, isn't that noteworthy. 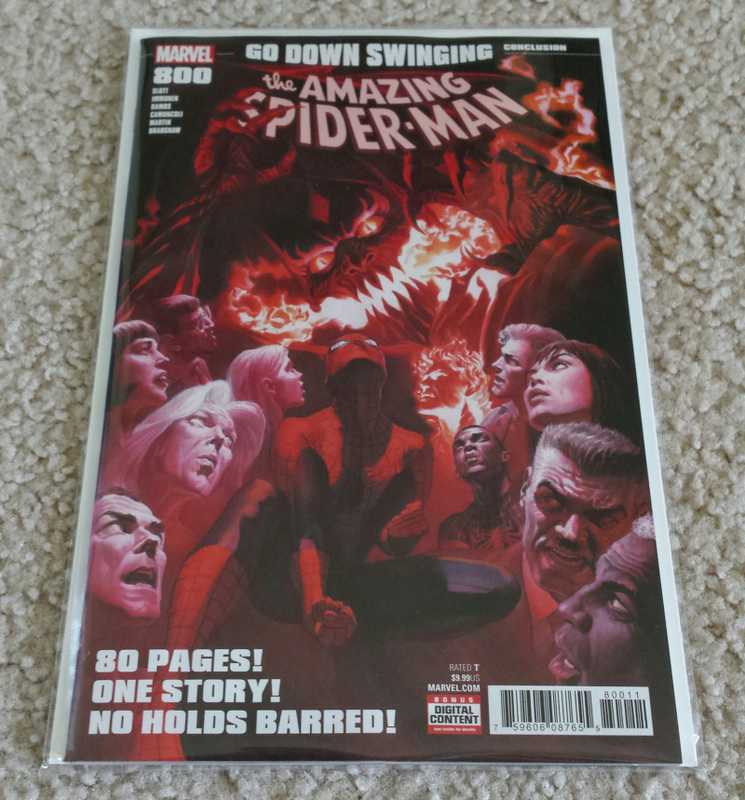 Since we're talking about Amazing Spider-Man, here's issue #800 which just came out. It's hard for me to imagine that it's up to issue #800. The first issue I got as a kid from the rack was #330, so 470 issues have been released in that time. I've managed to assemble quite a collection of them, and I now own many key issues I never dreamed I'd have when I was younger. And when I was younger, books like these came out. See how I effortlessly segue from topic to topic? Anyway, first up here is Uncanny X-Men #245, which is an early Rob Liefeld comic. Rob Liefeld was one of the heavy hitters of the 90s, so I thought I'd grab this one. Next to it is Fantastic Four #286. This is the second part to the return of Jean Grey, with the first part being in an issue of The Avengers. Finally, here is part six of the X-Cutioner's Song, which I was missing from the set. I have a real nostalgia for the 90s. I like to buy comics that exude that 90s aesthetic, and I feel that is best accomplished when it comes to comics with gimmick covers. 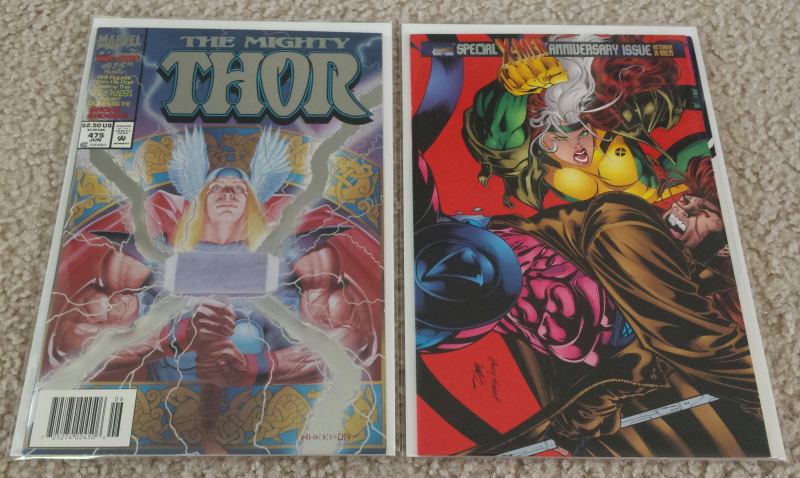 Here is Thor #475 and X-Men #45. 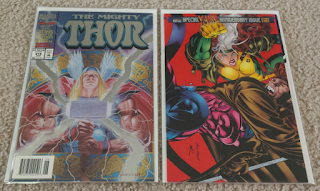 The Thor issue has silver foil lettering on it, and the X-Men comic has holographic lettering at the top and on the inside of the fold-out cover. I love holograms, and I'll typically buy any comic I come across with holographic imagery. 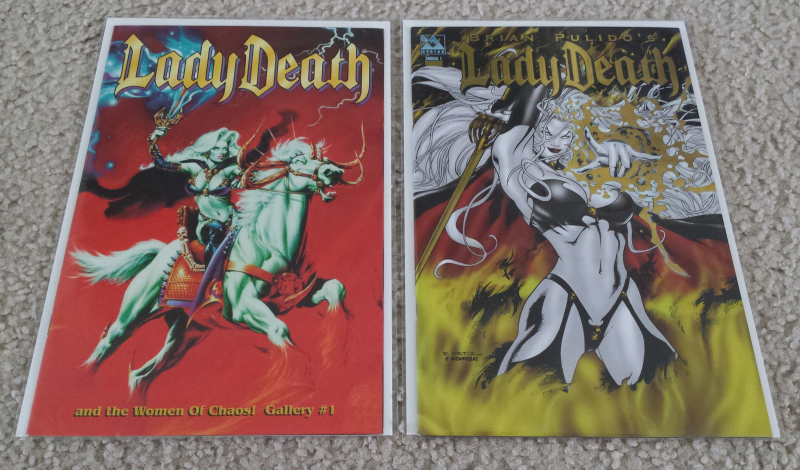 Then I got these two Lady Death comics. The one on the right has gold foil lettering on it. It's not from the 90s (It's actually from 2006) but it met my criteria for gimmick covers. The one on the left actually is from the 90s, though. 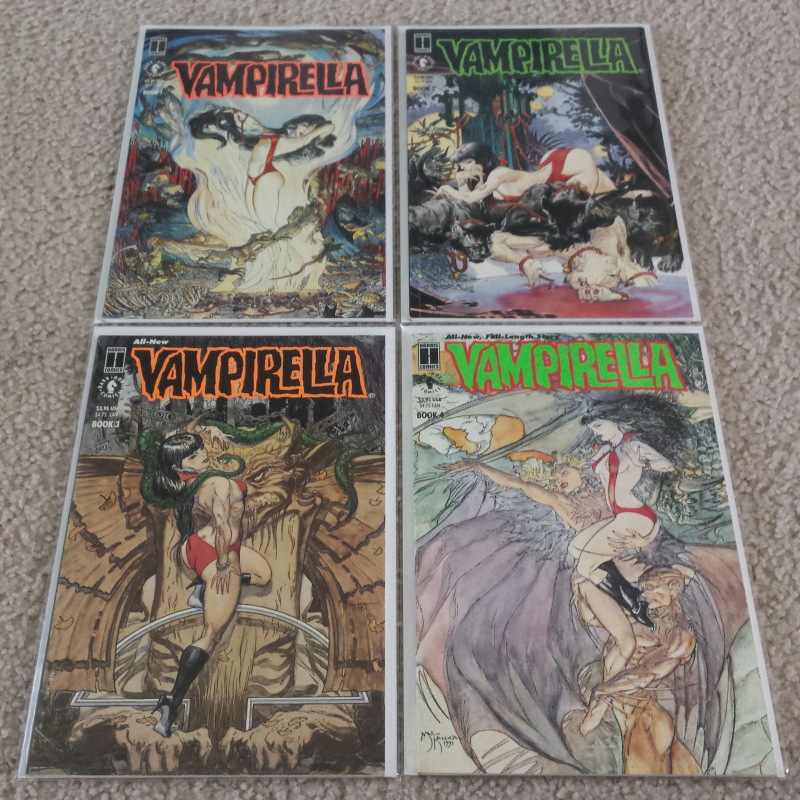 In 1991, Harris and Dark Horse put out these four issues of Vampirella in a series called Morning in America. These comics were released before Vampirella had her big comeback in 1992 at the beginning of the "bad girl" craze, which was a pretty dark time for comics and yet I'm strangely nostalgic for it. It was the 90s after all. Makes sense. I don't really have a way to segue into this one. Here are the remaining three issues of Transformers I needed to complete the initial four part miniseries which ended up becoming an ongoing series. 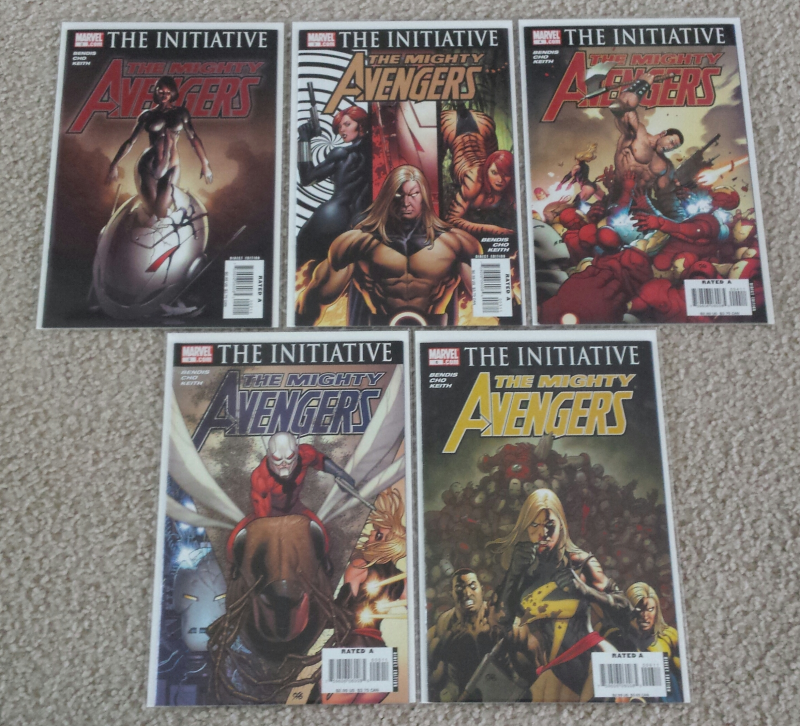 I'm only interested in owning the first four issues, and now I have them. I mentioned before how I have never been into Transformers, but I'll say that again here. I have never been into Transformers. I had some as a kid, but they aren't toys I have any fond memories of playing with. 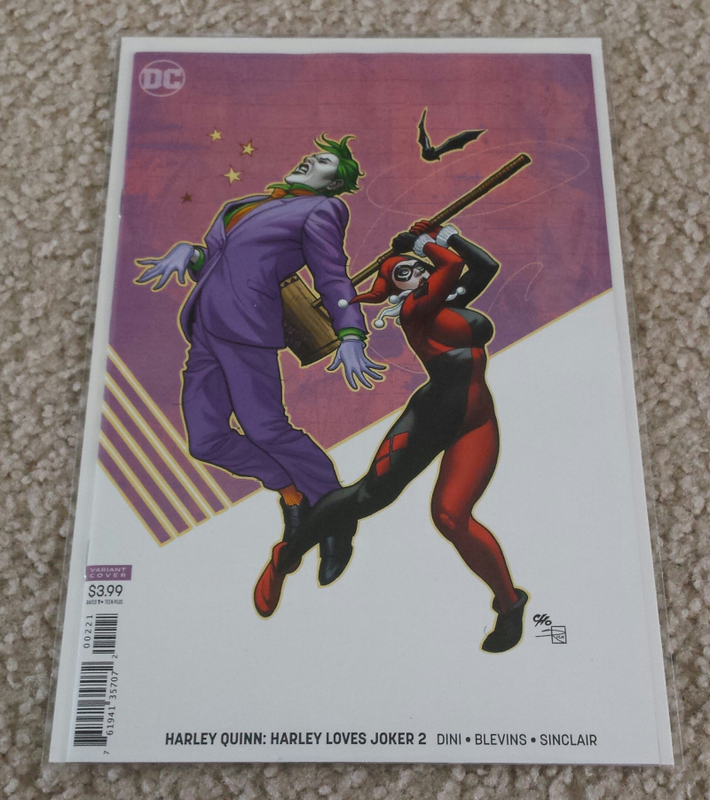 Here's the second part to the two issue miniseries Harley Loves Joker. It is, of course, the Frank Cho variant. 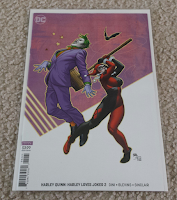 I've said all there is to say about these Cho Harley variant covers! 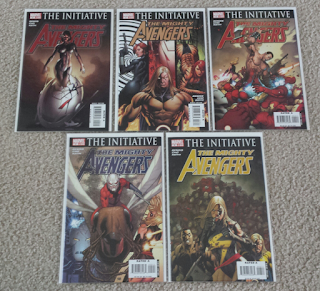 I also grabbed these from my local comic shop Campus Comics from the $1 boxes. These are all Frank Cho comics that I used to have but ultimately purged from my collection. Some of them are definitely the original copies I owned, and I can that tell because of the way the bags were taped. This isn't the first time I sold off something only to later re-purchase it again. I talked about it in great detail back in 2013 when I was talking about my history with the Sega CD. 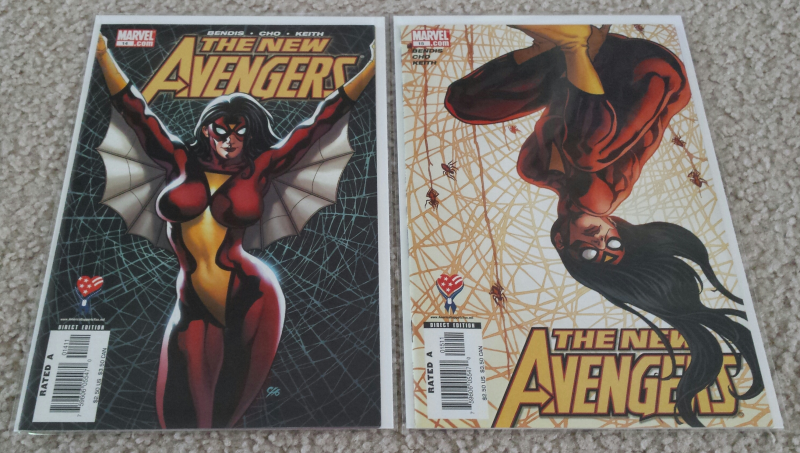 Additionally, I bought these two issues of The New Avengers for $1 each at the same time. 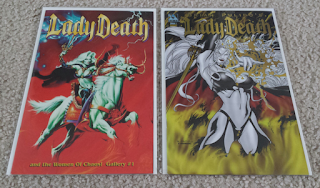 Again, these are Frank Cho comics that I definitely used to own but purged. I actually have the art on the left one as a refrigerator magnet. I think I have a nice little Frank Cho collection going at this point. But I don't really know what to say about them anymore. 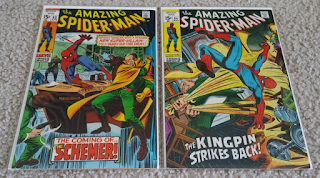 I bought these two comics this week from Campus Comics. It's called Infinity Countdown: Captain Marvel, which you might already know I like to get anything with Captain Marvel in it. 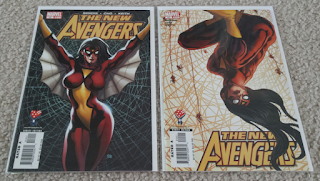 The one on the right is a variant cover. I honestly don't know which one I like more. 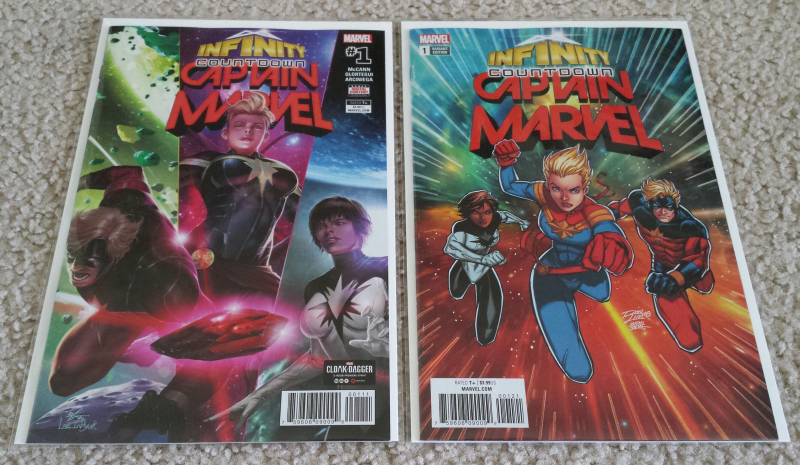 I feel like I need to get caught up on my Captain Marvel reading before the movie comes out. 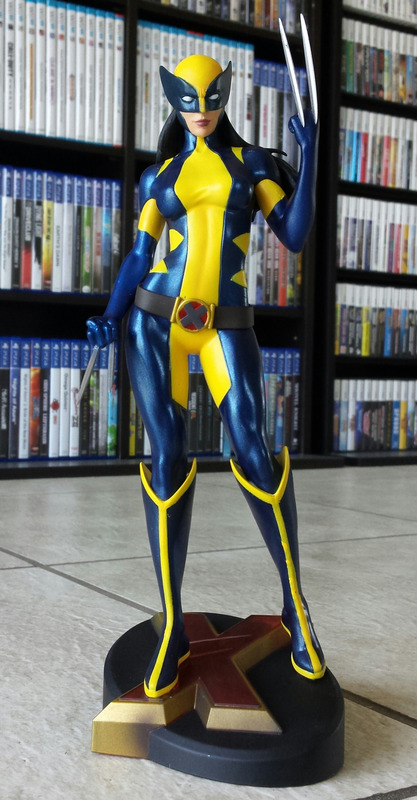 And finally, I got this X-23 Gallery statue. I like X-23 well enough (I'm not a super fan or anything) and I always used to play as her in Marvel vs Capcom 3, so I thought this would be a good addition to my collection. As with all Gallery statues, these are the low end of the price spectrum. They look really good for the price, though. There's a Savage Land Rogue statue coming out at some point that I'm going to have to have as well. And that's all I have for this comic haul article. I feel kind of bad about doing so many comic haul articles and not articles about things people actually might care about, so I'm going to try to do something about that soon. I have so many things queued up that I could finish and post, but things have been so hectic lately that I haven't had the motivation to work on them. These were originally intended to be something that I could post to fill in the time when I wasn't posting the more lengthy features. Hopefully things look up here soon.